Biraja Temple is one of the ancient Hindu temples located in the Jajpur district of Odisha, India. This present temple was built in 13th century. It is situated in the Jajpur Township which is nearly 125 KM north from Bhubaneswar. The main idol is Devi Durga who is worshiped by the name Viraja. The idol is having two hands (dwibhuja), in one hand she pierces the chest of Mahishasura with a spear and in other hand she pulls the tail of the Mahishasura.The Durga idol is standing on Lion in one leg and other leg is on Mahishasura chest. The Mahishasura is depicted as a Buffalo, not as regular human demon. The crown of Devi has symbol of Ganesha, Crescent moon and a Shivalinga.The temple covers a large area, and it has several Shiva linga and other deities. Jajpur is also known as Viraja Kshetra or Biraja Peetha. According to Skanda Purana, utkala khanda it washes all rajo guna of pilgrims. So called as Viraja or Biraja kshetra. 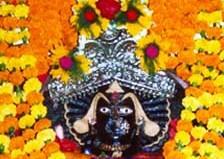 The main temple of this place is called Biraja Devi’s temple. After her name, this place is also known as Biraja Peetha or Biraja Khetra It is one of 51 Sakti Peetha (sati pitha) and it is where Sati’s navel fell. The temple was built in 13th century during the Kalinga time. This district is also called Baitarani tirtha, where many historic temples are seen. 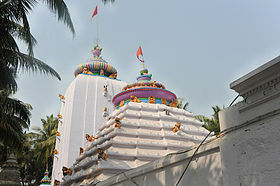 The main temple of the town is that of Maa Biraja’s temple. She is mounted on a lion with a spear with one arm and holds the tail of Mahishasur with the other. Festivals are held at Durga Puja, Kali Puja and on Amabasyas (new moon).In this temple there are 108 shrines of Lord Shiva. Navi Gaya is found here inside the temple. Inside the temple premise there are many other temples of Ma Bagala, Lord Vishnu, Hanumanji, Lord Shiva and some more. There is a huge sacred tree where the devotees bind colourful threads to fulfill their wishes. On the body of the temple, there are beautiful engraves of many human and animal figures. Give Responses for "The Biraja Temple of Jajpur"